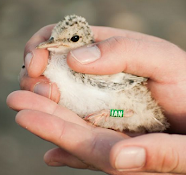 Kilcoole Little Tern Conservation Project: A colour-ring 'terns' up in Kilcoole! A colour-ring 'terns' up in Kilcoole! Yesterday I spotted a Little Tern on the shingle with colour rings on its legs. It had a metal ring on the right leg and a yellow ring on the left. This colour combination is likely to be on a Tern ringed in the Isle of Man, where there are breeding Little Tern colonies on the Ayres to the north of the island. While I didn’t get a chance to read the inscription, hopefully I will get another chance in the coming days and we can find out more on this bird’s history. Numbers of Terns are on the rise. Plenty of courting behaviour was observed between showers today - see this photo of a male presenting his courtship gift to a discerning female. Other males have successfully wooed a mate and are prospecting potential abodes for their youngsters around the shingle. Although no Terns have laid eggs, the Ringed Plover and Oystercatcher are well on their way to parenthood. Three pairs of both Ringed Plover and Oystercatcher have made the colony home and are already incubating eggs. Territory disputes are flaring up between the species – with plenty of panicky Ring Plovers valiantly defending their nests! A new season. A new hope.